Cape Honeysuckle might have a misleading name, but this plant won't do you wrong! 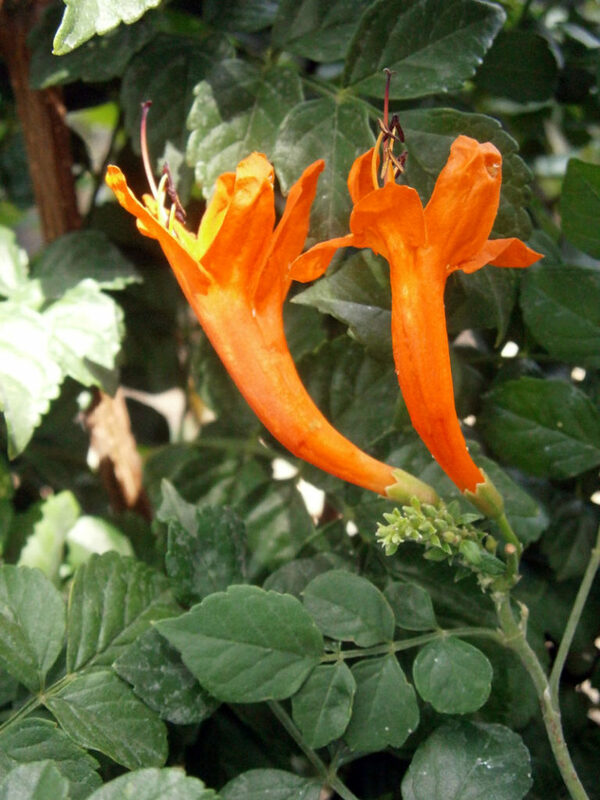 Not a true honeysuckle, it's actually related to trumpet vine, desert willow and jacaranda. It gets its name from the Cape of Good Hope in South Africa where it is a native plant. Yup, South Africa, where it gets nice and hot and dry. It does just as well here as it does there! The average size of this beauty is about 6-8 tall and wide, though it depends on how you prune it. It can be grown as a shrub or trained as a vine. As a shrub, it will have a loose, open vase shaped growth habit. As a vine, it can grow 15' or more. It's also a fast grower and if left to its own devices, will shoot up runners far from the main plant-just clip 'em if they get outta hand. Cape honeysuckle can be recognized by its glossy dark green, diamond shaped leaves. This plant will get covered in vibrant red-orange honeysuckle-like blooms year round. This no doubt attracts lots of butterflies, bees and hummingbirds. Cape honeysuckle is considered a tropical evergreen, but around here it tends to be a semi-evergreen or perennial. Most years it will not freeze back, but if it does, it comes back every spring. Grow Cape Honeysuckle in containers or in the ground. It grows best in full sun but can also tolerate partial shade. 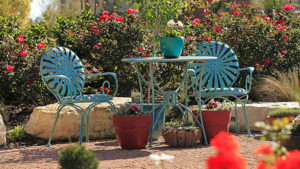 Pair it with perennials like Esperanza and Plumbago for explosive color! Tropical Milkweed has bright orange and red clusters of flowers early summer through fall. An herbaceous perennial with upright stalks, it sometimes looks a little skinny as a youngster. Don't worry, it will get bushier over time. It can get up to 3 feet tall and 1-2 feet wide. This variety is not native to Texas but to Mexico. Even so, it is well adapted to our climate. Grow it in full sun with maybe just a little shade in the afternoon. This tough little plant is deer resistant and tolerates heat, poor soil and drought. In fact, the easiest way to kill milkweed is by over watering! It has a long taproot that helps it get through dry spells. Tropical Milkweed has no serious pests or diseases except for the occasional rust spots or aphids. Now lets talk flowers! 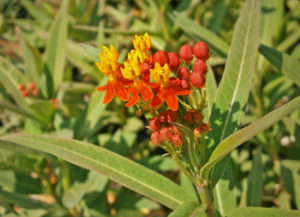 This butterfly weed attracts, you guessed it...butterflies. Flowers are a nectar source for many bees, hummingbirds, beneficial pollinators. The leaves are also a food source for monarch butterfly caterpillars. The downside to this particular variety? It blooms well into late summer and fall, which can delay monarch migration. For this reason, you may want to help out by planting other varieties of Asclepius like "tuberosa" or "asperula". You can also just cut the plants down around September and keep them that way until spring. Read more about the downsides and why you would do all that here. Grow these beauties as a border or a backdrop for other low growing perennials. They are also good for rock gardens or naturalized areas in the landscape. Pair them with other butterfly favorites like Butterfly Bush, Gregg's Blue Mist Flower or Coneflower. If you're feeling adventurous, milkweed has several other uses aside from aesthetics and as a butterfly cafe. Pioneers and native Americans used to boil the roots to treat diarrhea, asthma and other respiratory illnesses. Young seed pods were boiled like okra. (A word of warning: Always consult a knowledgeable source before ingesting or topically applying plant concoctions!) And if you've got LOTS of time on your hands, the down from milkweed seeds can be spun to make candlewicks. The seed pods are also nice for flower arrangements. Here at The Garden Center, we carry Tropical Milkweed through the growing season, but with its popularity this year, it's been hard to keep on the tables! As of this writing, we got 'em. But give us a ring first- just to make sure!